I don’t want to let too much time go by between the two long sword parts of sugata-kantei so here we go with part two. The mid-Muromachi period basically keeps the “Kamakura-revival” sugata of the early Muromachi period but what we can see is a decreasing nagasa, a more noticeable taper, a thicker kasane, and an increasing sakizori. These are all features connected to the shift from tachi to katana, a topic that well deserves a chapter on its own and should therefore omitted here. By the late Muromachi period, the classic tachi had been pushed into the background and mostly katana were produced when it comes to long swords. They have a noticeably shorter nagasa of 60~65 cm, a slightly elongated chû-kissaki (often with a pronounced fukura), a wide mihaba which does not taper that much, a thick kasane, and a deep sakizori. Those blades with a really short nagasa of around 60 cm were made for single-handed use and are referred to as katate-uchi (片手打ち). Representative schools and smiths for a late Muromachi period sugata are: The Sue-Bizen (末備前) school (Sukesada [祐定], Katsumitsu [長船勝光], Munemitsu [宗光], Kiyomitsu [清光], Tadamitsu [忠光]); for Kyô-mono Sanjô Yoshinori (三条吉則), Heianjô Nagayoshi (平安城長吉), and Kurama Yoshitsugu (鞍馬吉次); for Yamato the Sue-Tegai (末手掻) school; the Sue-Sôshû (末相州) school (Masahiro [正広], Tsunahiro [綱広], Yasuharu [康春]); the Shimada (島田) school (Sukemune [助宗], Yoshisuke [義助], Hirosuke [広助]); the Sengo (千子) school (Muramasa [村正], Masashige [正重]); the Sue-Seki (末関) school (Kanesada [兼定], Kanemoto [兼元]); Kaga smiths (Kashû Ietsugu [加州家次], Kashû Kiyomitsu [加州清光]); later generations Fujishima Tomoshige (藤島友重) and Uda (宇多); the 2nd generation Yamamura Yasunobu (山村安信); the 3rd generation Momokawa Nagayoshi (桃川長吉); the Gassan (月山) school; the Kai-Mihara (貝三原) school and the other offshoots of Bingo´s Mihara school; the Hiroyoshi (広賀) lineage of Hôki province; and for Kyûshû the Taira-Takada (高田) school (Taira Nagamori [平長盛], Shizumasa [鎮政], Muneyuki [統行], Shizunori [鎮教], Shizutada [鎮忠], Munemasa [統正]); the Tsukushi-Ryôkai (筑紫了戒) school; the Kongôbyôe (金剛兵衛) school; the Ôishi-Sa (大石左) school. 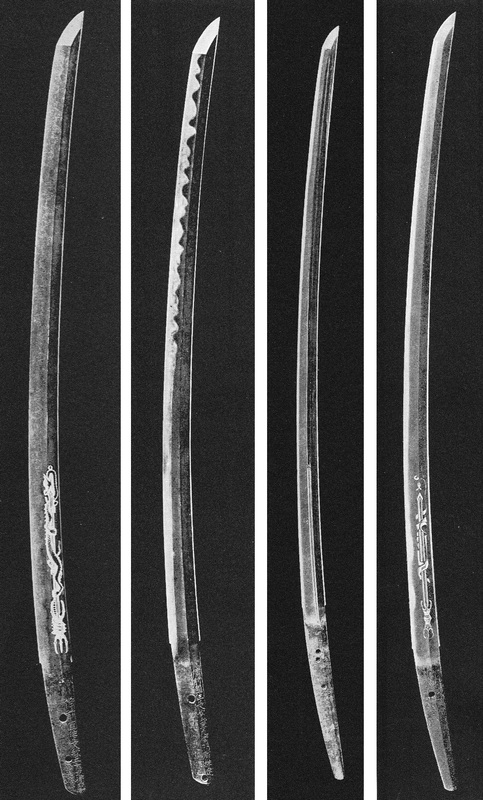 Blades increased again in length towards the end of the Muromachi period. Normal for that time is a nagasa of about 73~75 cm, a rather wide mihaba, a thick kasane, a chû-kissaki or a slightly elongated chû-kissaki, and a pronounced sakizori but which is no longer as strong as seen on the previous katate-uchi. Representative schools and smiths for a sugata from the end of the Muromachi period are: The subsequent Sue-Bizen (末備前) generations (Sukesada [祐定], Katsumitsu [勝光], Norimitsu [則光]); the Sue-Sôshû (末相州) school; the Sue-Seki (末関) school (Kanetsune [兼常], Kanenobu [兼延], Wakasa no Kami Ujifusa [若狭守氏房], Daidô [大道]); for Yamato the Kanabô (金房) school (Masatsugu [政次], Masashige [政重], Masazane [正真]); the Shitahara (下原) school (Yasushige [康重], Terushige [照重]); the Taira-Takada school; the Dôtanuki (同田貫) school (Hyōbu [兵部], Kiyokuni [清国], Masakuni [正国], Matahachi [又八], Kunikatsu [国勝]). Apart from continuing with the late Muromachi period sugata, a trend started in the Momoyama period which revived the oversized mid-Nanbokuchô blade shapes, but in their shortened condition. That means smiths from that time made katana with a wide mihaba, scarce taper and niku, a shallow sori, and an elongated chû-kissaki or an ô-kissaki, but with a nagasa of about 70~75 cm. Also the kasane of the Momoyama-era revival blades is a hint thicker than at the mid-Nanbokuchô period originals. As the climax of this revival trend was reached during the Keichô era (慶長, 1596-1615), we refer to such a sugata as Keichô-shintô-sugata (慶長新刀姿) Another term we find for sugata from that time is Keigen-shintô-sugata (慶元新刀姿) which refers to blades made from the Keichô to the Genna era (元和, 1615-1624). 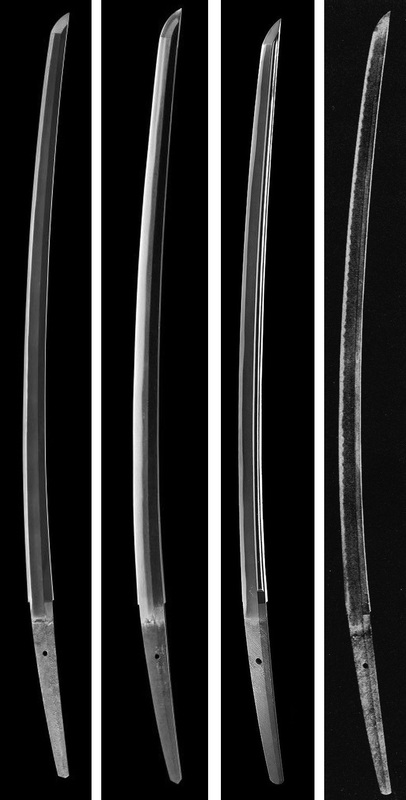 This term refers to the transition from kotô to shintô and includes the wide Nanbokuchô-revival blades made in the Keichô era and the beginning of the trend back to more classical shapes during the Genna era. Representative schools and smiths for a Momoyama period sugata or a Keichô-shintô-sugata are: Umetada Myôju (埋忠明寿); the Horikawa (堀川) school (Kunihiro [国弘], Kunimichi [国路], Kuniyasu [国安], Kunitomo [国儔], Kunikiyo [国清]); the Mishina (三品) school (Etchû no Kami Masatoshi [越中守正俊], Iga no Kami Kinmichi [伊賀守金道], Tanba no Kami Yoshimichi [丹波守吉道]); Echizen Yasutsugu (越前康継), Higo no Daijô Sadakuni (肥後大掾貞国), Yamashiro no Daijô Masanori (大和大掾正則), Hankei (繁慶), Nanki Shigekuni (南紀重国), Sagami no Kami Masatsune (相模守政常), Hida no Kami Ujifusa (飛騨守氏房), Higo no Kami Teruhiro (肥後守輝広), Hizen Tadayoshi (忠吉), Izu no Kami Masafusa (伊豆守正房). After the Momoyama-era trend back to mid-Nanbokuchô shapes, again a more classic sugata arrived on the scene. 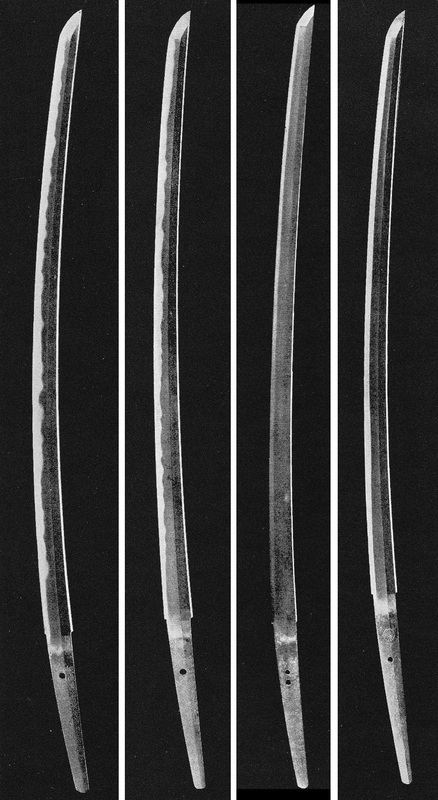 These blades have a nagasa of about 70 cm, a noticeable but not very strong sori, do taper, and show a chû-kissaki or a slightly elongated chû-kissaki. As this moderate shape started to appear with the Kan´ei era (寛永, 1624-1644), such a sugata is also referred to as Kan´ei-shintô-sugata (寛永新刀姿). Representative schools and smiths for an early Edo period sugata are: The Ôsaka-shintô (大坂新刀) masters (Oya-Kunisada [親国貞], 1st generation Kawachi no Kami Kunisuke [河内守国助]); Dewa no Daijô Kunimichi (出羽大掾国路), the next generation of the Mishina (三品) smiths, Soboro Sukehiro (そぼろ助広), Hidari Mutsu Kaneyasu (左陸奥包保), 1st generation Ôsaka-Ishidô Tameyasu (為康), the 2nd generation Ôsaka-Ishidô Yasuhiro (康広), the early Edo-period Shitahara generations (1st generation Chikashige [周重], 3rd generation Yasushige [康重], 3rd generation Terushige [照重]), the 2nd generation Hizen Tadahiro (忠広). From about the mid-17th century onwards, blade shapes change significantly. The nagasa measures still around 70 cm but the blades taper strongly, have a shallow sori, and end in a compact chû-kissaki which even tend to a ko-kissaki in certain cases. It is assumed that this change was due to new preferences in swordsmanship for thrusts rather than for cuts but if this is the only reason remains to be seen. Anyway, as this new blade geometry appears with the Kanbun era (寛文, 1661-1673) it is also referred to as Kanbun-shintô-sugata (寛文新刀姿). If one knows about the characteristics of a Kanbun-shintô-sugata, it is usually not that hard to recognize that a blade was made somewhere around Kanbun. In other words, a Kanbun-shintô-sugata is one of the more easier recognizable sugata. Please note that there are some Kanbun-shintô-sugata that have all Kanbun-shintô characteristics except for the shallow sori (for example third blade in picture 14). Representative schools and smiths for a Kanbun-shintô-sugata are: The next generation of the Ôsaka-shintô smiths (Inoue Shinkai [井上真改], Naka-Kawachi Kunisuke [国助], 2nd generation Sukehiro [助広], Echigo no Kami Kanesada [越後守包貞], Gonnoshin Terukane [言之進照包]); Edo-shintô smiths like Kazusa no Suke Kaneshige (上総介兼重), Yamato no Kami Yasusada (大和守安定), schools like the Nagasone (長曾禰) school (Kotetsu [虎徹], Okimasa [興正]); the Hôjôji (法城寺) school (Masahiro [正弘], Yoshitsugu [吉次]); the 2nd generation Sendai Kunikane (国包), Miyoshi Nagamichi (三善長道). The mid-Edo period faced about the same changes as the early Edo period. That means a peculiar shape, in this case Kanbun-shintô-sugata, was given up in favor of an again more moderate and what we would describe as a “typical katana” sugata. Thus the blades curve more, show a harmonious taper, and end in a chû-kissaki. As the Genroku era (元禄, 1688-1704) marks about the turning point back to “normal” katana shapes, the term Genroku-shintô-sugata (元禄新刀姿) is used to refer to blades made in that style. Representative schools and smiths for the mid-Edo period are: Tatara Nagayuki (多々良長幸), Ikkanshi Tadatsuna (一竿子忠綱), Nobukuni Yoshikane (信国吉包), Nobukuni Shigekane (信国重包), Musashi Tarô Yasukuni (武蔵太郎安国). Well, we must bear in mind that certain schools and smiths did not follow each and every new trend in blade shapes. For example the Hizen Tadayoshi school maintained from the early Edo period onwards the very same sugata. Their sugata is strong and impressive and might best be descibed in a nutshell as intermediate between Keichô-shintô and Genroku-shintô-sugata. Also the Satsuma-shintô smiths basically remained in terms of sugata in the Keichô-shintô era, although with an elongated chû-kissaki instead of an ô-kissaki. The craft of sword forging faced a strong decline after the turn to the 18th century. Basically the Genroku-shintô-sugata was kept until the appearance of master swordsmith Suishinshi Masahide (水心子正秀) who tried to revive the old kotô forging traditions, a trend known as fukkotô (復古刀), which also brought along a return to classic Kamakura-period blade shapes. That means in concrete terms the typical late-Edo period katana has a nagasa of about 70~75 cm, a little wider mihaba which tapers smoothly, a deep sori, and a chû-kissaki. Representative for the late Edo period, or if you want the early shinshintô era, are the smiths in the vicinity of Suishinshi Masahide like Taikei Naotane (大慶直胤), Hosokawa Masayoshi (細川正義), and Nankai Tarô Tomotaka (南海太郎朝尊). The bakumatsu era brought another revival, that is to say back to the impressive mid-Nanbokuchô shapes what means wide mihaba, scarce tapering and scarce hira-niku, a shallow sori, and either an elongated chû-kissaki or an ô-kissaki. Some of them are even interpreted as nagamaki-naoshi, i.e. with extreme long ô-kissaki and hardly and sori. But the kasane is usually a bit thicker than at the mid-Nanbokuchô originals. Representative schools and smiths for impressive, mid-Nanbokuchô-oriented bakumatsu-era sugata are: The Kiyomaro (清麿) school (Kiyomaro [清麿], Masao [真雄], Masao [正雄], Kurihara Nobuhide [栗原信秀], Saitô Kiyondo [斎藤清人], Kanetora [兼虎]); Koyama Munetsugu (固山宗次), Sa Yukihide (左行秀), Gassan Sadakazu (月山貞一). Not all smiths carried the mid-Nanbokuchô revival to its extreme. 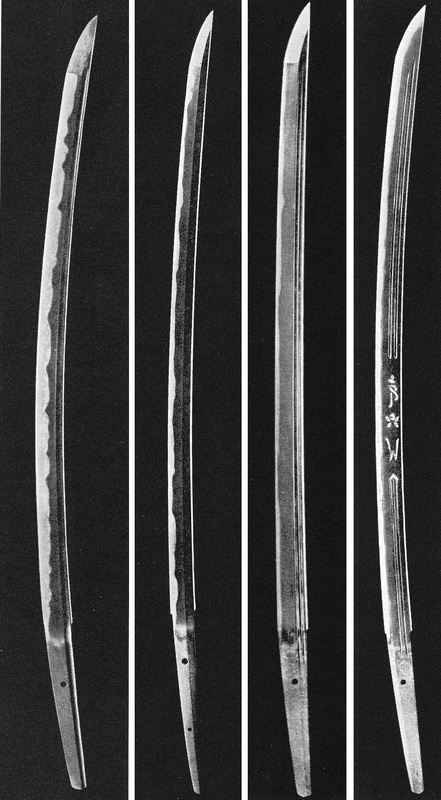 Well, although still some classic Kamakura-period sugata were made at that time, there was a general and evident trend to more massive blades which remind of Keichô-shintô at a glance. Representative smiths for such “moderate” mid-Nanbokuchô inspired shapes are: Kurihara Nobuhide (栗原信秀), Takahashi Naganobu (高橋長信), Koyama Munetsugu (固山宗次), Tairyûsai Sôkan (泰龍斎宗寛), the 7th generation Korekazu (是一), certain Mito smiths (Ichige Norichika [市毛徳鄰], Naoe Sukemasa [直江助政]), Hôki no Kami Masayoshi (伯耆守正幸), Oku Motohira (奥元平), Gassan Sadakazu (月山貞一). A peculiar blade interpretation that appeared in bakumatsu times is the so-called kinnôtô (勤王刀, lit. 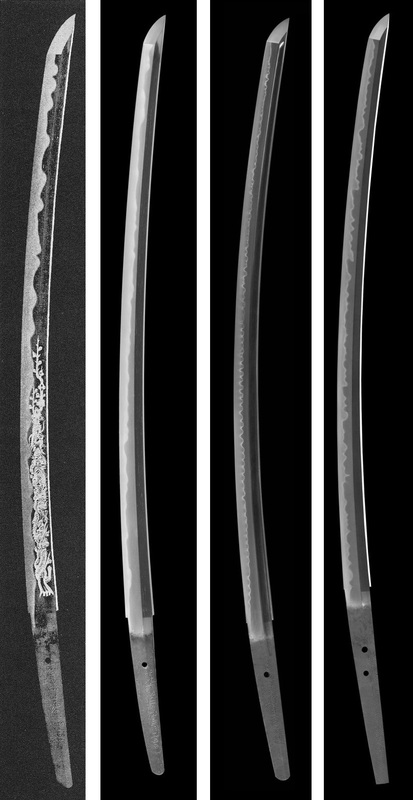 “royalist´s sword”) with an overlong nagasa of around 85 cm, hardly any sori, and a chû-kissaki. But it has to be noted that also shorter blades with the same geometry but measuring just around 65~75 cm, are referred to as kinnôtô. Representative for such kind of blades are for example Sa Yukihide and Saitô Kiyondo.